Transylvania: බොහෝ ශ්‍රී ලාංකික උගතුන් තුල කුහක සහ ඊර්ෂ්‍යා ගති ලක්ෂණ ඇත්තේ මන්ද ? I do agree with you in this matter. I too been a victim of such negativity at UOC, physics department during final year project. However, I would like to see those feedback you received. Since, you are using Mr. Rajasuriya's name, I believe it is fair to Mr. Rajasuriya if you post those feedback (of course covering all their contact details). Otherwise, this is just "he said, she said." Sometimes, I think you put these stuff to collect data towards your Ph.D.. All the best! He is my FB friend ; I have nothing against him just highlighting some of my observations. He is most welcome to comment on this . I wanted to be open and transparent, thats why I used names and facts. I do understand that and you had already mentioned it in your blog post. My point is as a reader, I should be able to draw the conclusions based on your "received feedback." That will legitimize your claims. Just my opinion and thank you for the reply. හ්ම්ම්, මේ පෝස්ට් එකෙත් යම් යම් 'කුහක සහ ඊර්ෂ්‍යා ගති ලක්ෂණ' පෙනෙන්නේ ඔබත් ශ්‍රී ලාංකික උගතෙක් නිසාදෝ යයි සිතෙන්නේ මට විතරදෝ? Not only local professionals but also those who migrated in hope of greener pastures also show feelings of insecurity and narcissism - for an example one expatriate man of science, equated Sri Lankan medical colleges with those of utterly backward African nations - in the process elucidating more about himself than about the quality of medical education in SL. ඔබේ අදහස සියට සියයක් එකඟයි. ඒ පිළිඹදව මටද ආයතනය තුල අත්දැකීම් දමුදායක් ඇත. කංසා පිළිඹදව වූ "ත්ර්යිලෝක විජයා" පොත මා කියවුවා. කංසා දුම ආග්‍රහණය පිලිම්බන්දව වෛද්‍යවරයකු සහ මනස සම්බන්ධ වෛද්‍යවරකු ලෙස ඔබගේ අදහස කුමක්ද? අපේ රටේ උගතුන්වූ පලියට තැනක් ලැබෙන්නේ නැත. ඒ නිසා අනිකා කපාගෙන යාම දියුණුවට හේතුවේ. ලමයෙකු පාසැලකට ඇතුලත් කිරීමේ සිට සියලුම කටයුතු සුදුසුකම් මත සිදු නොවේ. එනිසා තවෙකෙකුට උදව් කිරීම සියදිවි නසා ගැනීමකි. යහපත් අයෙකුට සතුටින් සිටීම ඉතා අසීරුබව මාගේ අත්දැකීමයි. Yes this is true.Starting from scholarship exams upto the level of professionals this can be seen.But i guess religious leaders,parents are also (some of them) are responsible for it because they have the mentality of surpassing others and racism.My opinion is people should develop their good attitudes to listen to others and make them understand every profession followed by people does a major role in society influenzing lives of living beings for the benefit. නිදහස් අද්‍යාපනයට පින්සිදුවෙන්න පට්ට හිගන පවුල්වල ය ඉගෙනගෙන ඉහල තනතුරු වලට ගිහින් කරන හීන මාන ඉරිසියා වැඩ තමයි මුලික හේතුව . මම ලංකාවේ මෙන්ම පිටරටත් ඉගන ගෙන තියෙනවා , නමුත් එහි ලොකු වෙනසක් නැහැ . බලන්න ලංකාවේ උනත් වැදගත් කෙනෙක් ඉගෙන ගත්තම රටට සමාජයට හොදයි ඉරිසියාව කුහක කම නැහැ . ඉතින් කොහොමද ජාන වෙනස් කරන්නේ. මම ආව කැනඩාවට දරුවොත් එක්ක නිදහසේ ජිවත් වෙන්න . මොන දේවල් උනත් කුහක කම් ඉරිසියාව නැති සමාජයක ඉන්න පුළුවන්, නමුත් මෙහෙ උනත් සිංහල උන් ආශ්‍රය කලොත් බඩුම තමයි. මම දරුවන්ට කියන්නේ මගේ උනත් මොනවා හරි කුහක කමක් දැක්කොත් වහාම කියන්න , ඔය ගොල්ලෝ ඒවා ගන්න එපා, යහපත් මිනිසුන් විදියට සමාජයට වැඩ දායකව ඉන්න කියල. විවේචන උනත්ත මන්ට අවශ්‍යදේ පමණක් අරන් අනවශ්‍ය දේ බැහැර කලාම හරි. I think, before our graduates pass out from Universities, the subject called Theory of Knowledge should be taught. That subject make them humble when delivering their services to the community, because the graduates aware of the Theory Knowledge knows that, what they learnt from Universities was simply a borrowed stuff rather than a Wisdom. This is why foreign educated people are reluctant to come back, esp PhD holders to Sri Lankan university system. They become victims of their own superiors, peers as well as university teachers. I totally agree with you. I too have witnessed and undergone similar experiences during my carrier in state service. Once a young talented junior Sri Lankan engineer of our section has written a paper on simplifying a well-known method of estimation of floods, by evaluating the area under a parabolic flood hydrograph curve, by considering it as two triangles and showed that the resulting error is insignificant. He has sent an abstract of this paper to a peer scientific international Journal published in France, and reviewers have accepted it for publication and asked him to send it for universal discussion and comments after its publication. However, they insisted that it should be sent through the Country representative, who is Ex-officio the Head of our Department. When author tried to submit this to the Director through our sectional head, the latter did not want to forwarded it to Director and withhold it saying him, before we submit it to an International Journal, it should be discussed at a Local Forum for its comments. We all knowingly our Sectional Heads character, I told our Junior to wait for another two weeks, as our boss was scheduled to go abroad to participate in a conference, and I will be the acting Head our section during that period. When our boss left, I personally took it to our Director explained to him the circumstances. Our Director, who was aware our persons character told me “you can’t change people” and submitted it to the journal with his recommendations. It appeared in that journal and got very positive comments. This young engineer later got a Scholarship to France, and after his training he did not return, paid back the cost of the scholarship, and now attached to a Scientific Research Institute in France. රුවන් අමනාප වෙන්නනං එපා මම මෙහෙම මේ විධිහට සම්බන්ධ වුනාට. ඔබතුමාගේ සමහර ප්‍රකාශ තුල ශ්‍රී ලාංකික අධ්‍යාපනය අතිශය පහතට ඇද දමනවා හැමවිටම හැමදාම. මට හිතෙනවා ඔබගේ යම් කාලයකදී සිතේ පැලපදියම්වු ඔබට රිදුනු දෙයක් එලියට එනවා කියා. ඔබගේ මේ ප්‍රකාශයේ ගැබ්වතියෙන්නේ එය වියහැකියි. මෙසේ කිව හැක්කේ ඔබ ලංකාවේ පශ්චාත් උපාධි ආයතනයක මනෝචිකිත්සනය පිලිබඳ Masters (MSc / MPhil) මට්ටමේ උපාධියක් ලබා PhD උපාධියට යාමට "රෙකමන්ඩේශන් ලිපියක්" නොදුන්නා නම් පමනයි. ඔබට එසේ වූවාද! "රෙකමන්ඩේශන් ලිපියක්" අවශ්‍ය වන්නේ transcript එකට පොඩි සපෝට් එකක් වශයෙන්නේ. බොහෝ කොට බලන්නේ transcript එකේ strength එක නෙමෙයිද! ඇරත් රෙජිස්ටර වෙන්නේ online නේ. ඒවගේම "රෙකමන්ඩේශන් ලිපිය" ඒ අය දකින්නේ process එකේ අන්තිම හරියේදී interview එකකුත් තිබුනොත්නේ නේ. මම දන්න විදිහට PhD එකට යනව නම් අදාල විශය ක්‍ෂේස්ත්‍රයේ ප්‍රථම උපාදියේදී first class එකක් තිබුනත් නැතිනම් PG Diploma/ MSc/(Mphill) හරහා ගියත් සියල්ල කර ගතයුත්තේ තමන් ඉදිරිපත් කරන ඒ පූර්ව සුදුසු කම ලබාගත් විශ්වවිද්‍යාලයෙන් කියායි. 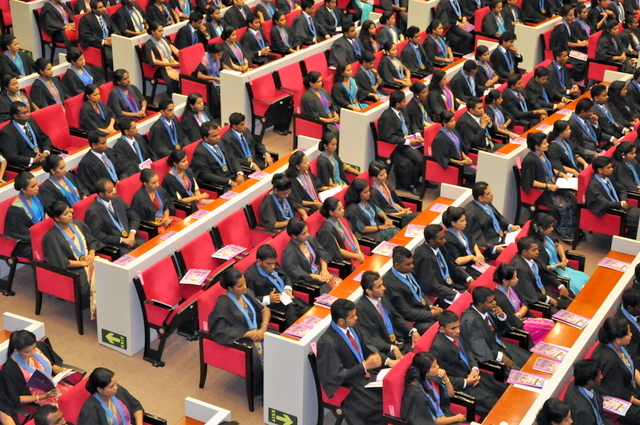 ඔබට එහෙම නොදුන්නා නම් PGIM එක වැරදියි. ඒත් ඔබම ලියා තැබූ ඔබගේ බොහෝ දේ කියවා ඇතිනිසා මට සිතෙන්නේ මේ චෝදනාව සාධාරන නොවන බවයි. ඔබගේ මෙම විරෝධතාවය කෙසේ වෙතත් ඔබ බොහෝ ප්‍රයෝජනවත් ලිපි ලියනවා. අප ඒවා අගය කරනවා. කරුනාකර ඉදිරියටත් ඒ විද්‍යාත්මක දේ ලින්න ඒත් මේ අප්‍රසාදය පතුරවන්න එපා. හැම සමාජයකම මෙය තිබෙනවා. කලක් කැනඩාවේ ජීවත්වන මා ඔබේ විශ්ලේෂණය සාධාරණ ලෙස දකිමි . බහුතරයක් එසේ වුවද හොද අයද නැතුවා නොවේ . දැනුම සහ උගත්කම ආභරණයක් නොකර මෙවලමක් කර ගැනීම මෙහි වෙසෙන උගතුන් තුලින් දකිමි . අතොරක් නැති සංවිධාන සහ කල්ලි ලංකාවේ මෙන්ම මෙහිද දකින්නට ඇත්තේ එබැවිනි. අළුතින් මෙරටට පැමිණි නව සංක්‍රමිකයන්ට පවා තම අත්දැකීම් ඇති අංශවලට යොමු වන්නට අපේ ඇත්තන් අඩුවෙන් උදව් කරන්නේ ඒ සැකය නිසා බව සිතිය හැකිය . ඔබේ ලිපිය අළුත් විදිහකට හිතන්නටත් ධනාත්මක ප්‍රතිචාර දක්වන්නට සුළු මොහොතක් හොයා ගන්නටත් ඇස් අරවන්නක් වේ යැයි සිතමි . Ape bahutharayak acadamicsla nam self serving garbage thamai. No malice . Lets see what Mahesh Raja has to say Ruwan ? "ඔබතුමාගේ සමහර ප්‍රකාශ තුල ශ්‍රී ලාංකික අධ්‍යාපනය අතිශය පහතට ඇද දමනවා" ඉහත MR මහතා/මෙය ගේ කොමෙන්ටුවේ උපුටා ගැනීමකි. වර්තමාන ලාංකික අධ්‍යාපන රටාව තුළ "විෂය දැනුම" ට මුල්තැනක් දීම හැම විටම දක්නට ලැබෙන්නක් නොවන්නේද!. විශේෂයෙන් පාසල් අධ්‍යාපන අවස්ථාවේ කටපාඩම හා මතක තබාගැනීමටත් ඒ අනුව පිළිතුරු ලියා විභාග සමත් වීමටත් අවස්ථාව සැලසී තිබීම මූලික ලක්ෂණයක් ලෙස දක්නට ලැබෙනවා. ඒ නිසා මිනිස් ගුණ ධර්ම වර්ධනයට මුල්තැනක් ලාංකික අධ්‍යාපනය තුළ දක්නට ලැබෙන්නේ නැහැ නේද? ඉගෙනුම් ඉගැන්වීම් අවස්ථාවන්හි ගුණ ධර්ම වර්ධනයට ඉවහල්වන ක්‍රියාකාරකම් හෝ ක්ෂේත්‍ර වැඩ කුසලතාවර්ධනයට අවස්ථා සමග දැනුම වර්ධනය කරගැනීමට අවස්ථා සැලසීම විශේෂයෙන් මුල්කාලීන පොදු අධ්‍යාපන අවස්ථාවේ හෝ වැදගත් කොට සලකනතාක් මේ දුබලතාවෙන් ගැලවිය නොහැක බව පෙනීයයි. පවතින අධ්‍යාපන රටාව හොඳ බවක් ගැන කිසිම ආකාරයකින් සිතිය නොහැකියි. රුවන් එම් ජයතුංගයන් පෙන්වා දෙන ලක්ෂණ 12 තුළම පෙනෙන්නෙ ආකල්ප සෝදාපාළුවීමන් ඇතිව පවතින ඛේද ජනක සහගත බව නොවේද! Actually why Sri Lanka cannot develop becouse of aforesaid factor. It's like this . Let's say thanks to country free education people who deosnt upgrade as thrre generation will come some good level of adminstaration and there mind is not ready to serve to society with good and fair mind . Let's think and compere Monaragala and Colombo reside two students are going to face A/L exam same year . Monaragala students father is a Farmer and grandpa is Hunter. Colombo student s father is Lowyer and mother is Dr . Both face same exam and accordingly District marks Monaragala student will through to university but Colombo student though his marks is rather than good comparely Monaragala one cannot through to university . But if we concerns there life level and thinking pattern different like up side down becouse of there life standuers . Characters. They will spoil all value of system .